- Publisher As this world's trouble beats us down, we crave reasons to be hopeful, to look ahead to a brighter day. Author Janet Chester Bly takes us beyond our present suffering and toward the blessing of hope that God faithfully brings. These thirty-one meditations include Scripture, anecdotes, quotations, and true stories that vividly portray how hope flows from God's divine response to our human cries.^^*Presents anecdotes of real-life experiences that authenticate the cultivation of hope.^*Short chapters can be used for a month-long daily devotional aid.^*Offers assurance that adversity can result in spiritual maturity and deepened relationships with God and others.^*Teaches that suffering authenticates the encouragement we can offer others. As this world's trouble beats us down, we crave reasons to be hopeful, to look ahead to a brighter day. 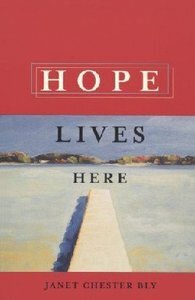 Author Janet Chester Bly takes us beyond our present suffering and toward the blessing of hope that God faithfully brings. These thirty-one meditations include Scripture, anecdotes, quotations, and true stories that vividly portray how hope flows from God's divine response to our human cries.^^*Presents anecdotes of real-life experiences that authenticate the cultivation of hope.^*Short chapters can be used for a month-long daily devotional aid.^*Offers assurance that adversity can result in spiritual maturity and deepened relationships with God and others.^*Teaches that suffering authenticates the encouragement we can offer others.